Cooling your wine cellar and maintaining a constant temperature is integral to creating a properly functioning environment for storing your wine. Proper cellaring of your fine wines will preserve the vintages while they mature in the right temperature and relative humidity. We are very proud to be an authorized dealer for Air Innovations, makers of the ultra-reliable Wine Guardian cooling units. These systems are custom sized to meet your very specific needs. Offering “Through-the-Wall” (TTW) units, ducted self-contained systems, and split systems, the quality and style of the Wine Guardian is unquestionably one of the finest wine cellar cooling systems on the market today. Proudly, Signature is also an authorized dealer for Bacchus Cellar Systems, the ultimate in wine preserving refrigeration. Bacchus Wine Cellar Systems integrate exact temperature control and optimal humidity (50-70% RH) along with a streamlined, stainless steel ceiling mounted evaporator. Its patented temperature/humidity control allows for a constant supply of optimal cellar conditions. 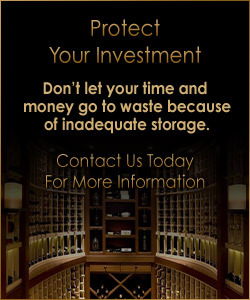 Wine Guardian environmental control systems offer superior performance and reliability for all of your residential and commercial wine room conditioning needs. Completely self-contained through-the-wall of remote systems provide optimal temperature and humidity control for the preservation and enjoyment of your wine investment. Introducing the new Through-the-Wall (TTW) Wine Cooling System from Wine Guardian, the renowned leader in wine preservation. Perfect for small to mid-sized cellars, this innovative system offers exceptional airflow and maintains optimal temperature and humidity with the quietest operation in its class. This split system concept places the condensing unit away from the living space and moves the compressor and fan noise to a less obtrusive location. One quiet evaporator fan produces maximum air flow with the lowest decibel output possible. Both Wine Guardian and Bacchus systems provide their respective versions of a split system.